Conquer islands and open treasure chests to put more gold in your pockets. 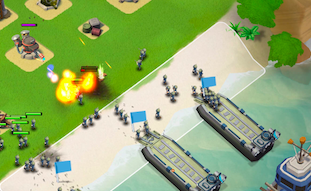 If you're a fan of Supercell's Clash of Clans, chances are you already downloaded the company's recent Boom Beach. This addictive action/strategy game is free-to-play. We covered it extensively this week, including how to play videos, general cheats and tips, how to assault and defend bases and more. For our last guide, we're taking a close look at gold. Gold is the general currency that you'll use when it comes to improving vehicles and soldiers. It never hurts to have enough of this on hand, especially when you're making your base stronger. You can find gold in a number of places. First, Residences let you build a community, and those grateful enough to move in will pay. Consider it an agreeable trade-off. Conquering islands will also reward you with gold. Not only will you gain experience from battles, but grateful villagers will provide you with a gold bonus to show their gratitude. Just make sure you're strong enough to take certain islands. Stock up on gunboats and troops, then come back. In addition, you'll also want to keep an eye open for Treasure Chests. These are scattered throughout the islands, and you'll be able to spot them a bit easier once you upgrade your radar. Once you see one, don't hesitate to jump on it and you'll be promptly rewarded.